The Very Large Telescope Interferometer at ESO’s Paranal Observatory in Chile has obtained the sharpest view ever of the dusty disc around an aging star. For the first time such features can be compared to those around young stars — and they look surprisingly similar. It is even possible that a disc appearing at the end of a star’s life might also create a second generation of planets. As they approach the ends of their lives many stars develop stable discs of gas and dust around them. This material was ejected by stellar winds, whilst the star was passing through the red giant stage of its evolution. These discs resemble those that form planets around young stars. But up to now astronomers have not been able to compare the two types, formed at the beginning and the end of the stellar life cycle. Although there are many discs associated with young stars that are sufficiently near to us to be studied in depth, there are no corresponding old stars with discs that are close enough for us to obtain detailed images. But this has now changed. 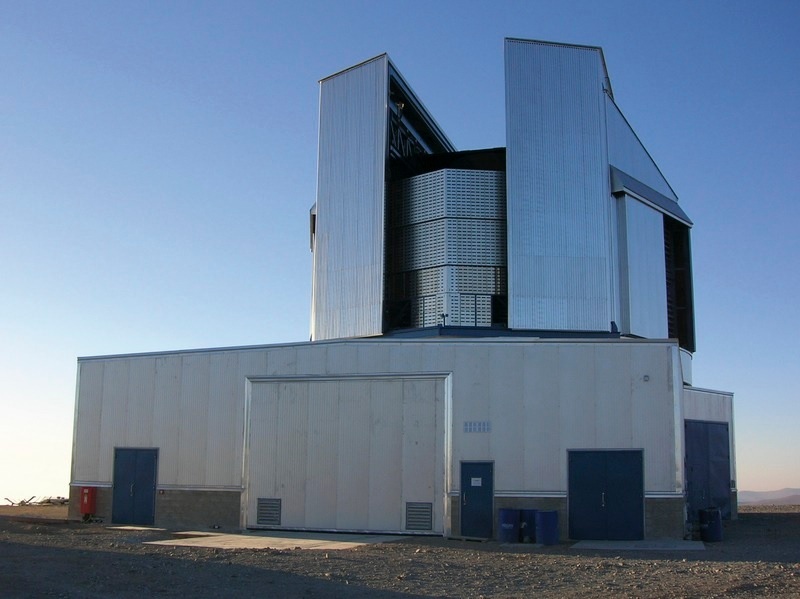 A team of astronomers led by Michel Hillen and Hans Van Winckel from the Instituut voor Sterrenkunde in Leuven, Belgium, has used the full power of the Very Large Telescope Interferometer (VLTI) at ESO’s Paranal Observatory in Chile, armed with the PIONIER instrument, and the newly upgraded RAPID detector. Their target was the old double star IRAS 08544-4431 , lying about 4000 light-years from Earth in the southern constellation of Vela (The Sails). This double star consists of a red giant star, which expelled the material in the surrounding dusty disc, and a less-evolved more normal star orbiting close to it. Thanks to the unprecedented sharpness of the images  from the Very Large Telescope Interferometer, and a new imaging technique that can remove the central stars from the image to reveal what lies around them, the team could dissect all the building blocks of the IRAS 08544-4431 system for the first time. The most prominent feature of the image is the clearly resolved ring. The inner edge of the dust ring, seen for the first time in these observations, corresponds very well with the expected start of the dusty disc: closer to the stars, the dust would evaporate in the fierce radiation from the stars. “We were also surprised to find a fainter glow that is probably coming from a small accretion disc around the companion star. We knew the star was double, but weren’t expecting to see the companion directly. It is really thanks to the jump in performance now provided by the new detector in PIONIER, that we are able to view the very inner regions of this distant system,” adds lead author Michel Hillen. The team finds that discs around old stars are indeed very similar to the planet-forming ones around young stars. Whether a second crop of planets can really form around these old stars is yet to be determined, but it is an intriguing possibility. “Our observations and modelling open a new window to study the physics of these discs, as well as stellar evolution in double stars. For the first time the complex interactions between close binary systems and their dusty environments can now be resolved in space and time,” concludes Hans Van Winckel. The name of the object indicates that it is a source of infrared radiation that was detected and catalogued by the IRAS satellite observatory in the 1980s. The resolution of the VLTI, used with the four Auxiliary Telescopes, was about one milliarcsecond (1/1000th of 1/3600th of a degree). This research was presented in a paper entitled Imaging the dust sublimation front of a circumbinary disk, by M. Hillen et al., to appear as a letter in the journal Astronomy & Astrophysics. The team is composed of M. Hillen (Instituut voor Sterrenkunde, Leuven, Belgium), J. Kluska (University of Exeter, Exeter, United Kingdom), J.-B. Le Bouquin (UJF-Grenoble 1/CNRS-INSU, Institut de Planétologie et d’Astrophysique de Grenoble, France), H. Van Winckel (Instituut voor Sterrenkunde, Leuven, Belgium), J.-P. Berger (ESO, Garching, Germany), D. Kamath (Instituut voor Sterrenkunde, Leuven, Belgium) and V. Bujarrabal (Observatorio Astronómico Nacional, Alcalá de Henares, Spain).